Insider: Blacpain Fifty Fathoms Automatique for Ladies. The Perfect Diver's Watch for Ladies that Know Better. This time we have decided to create a special post for our female readers. 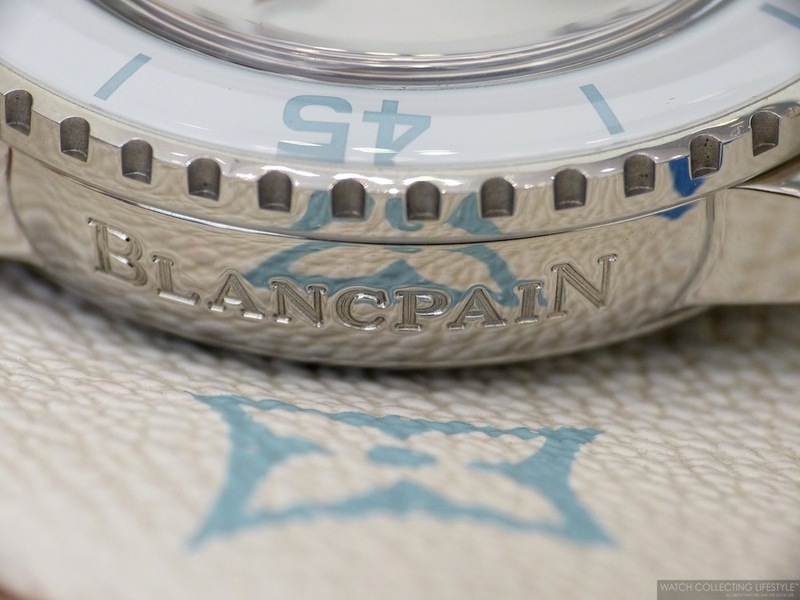 This special photo gallery features the Blancpain Fifty Fathoms Automatique in white and baby blue just for the ladies. This Blancpain Fifty Fathoms ref. 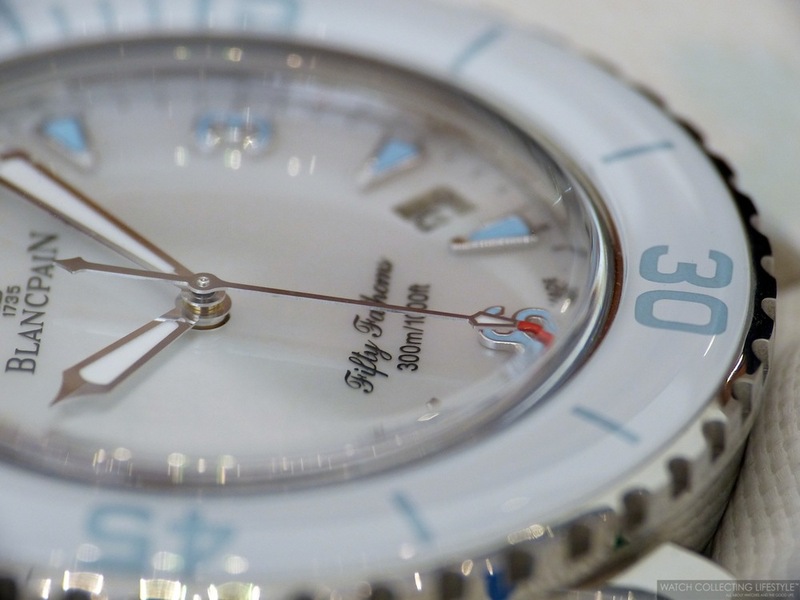 5015A-1144-52A comes fitted with a gorgeous white mother-of-pearl dial with baby blue accents and matching rotating bezel. The ladies version of the Fifty Fathoms Automatique measures 45mm in diameter —same as the men's model— but its case is not fitted with an anti-magnetic protective case back like on the traditional black dial Fifty Fathoms ref. 5015-1130-52. The ladies model is fitted with a display case back that allows for a full view of Blancpain's automatic calibre 1315 composed of 227 parts, 35 jewels and that provides a power reserve of five full days when fully wound. A power reserve of this nature is ideal for those ladies that like to rotate their watches throughout the week without needing to worry about setting the time after the watch has stopped after two days of not wearing it. 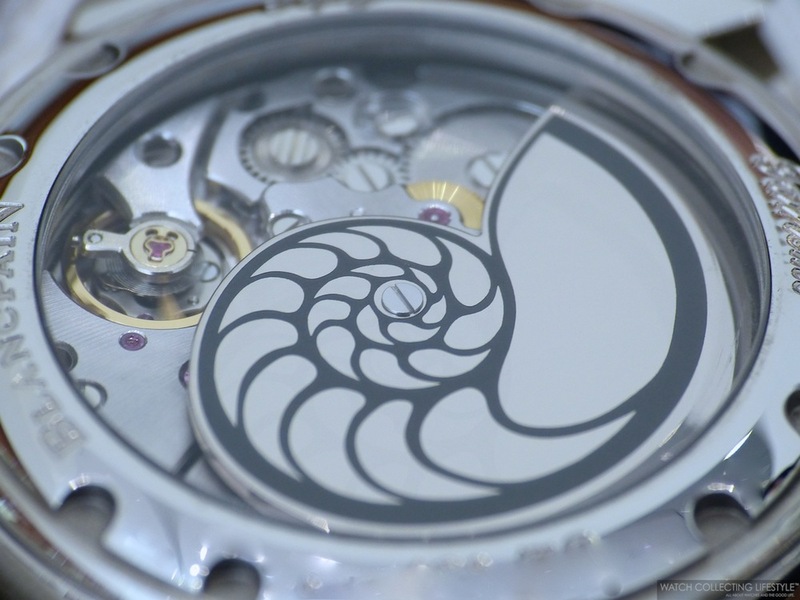 Additionally, the rotor on the movement is decorated with the beautiful conch motif. 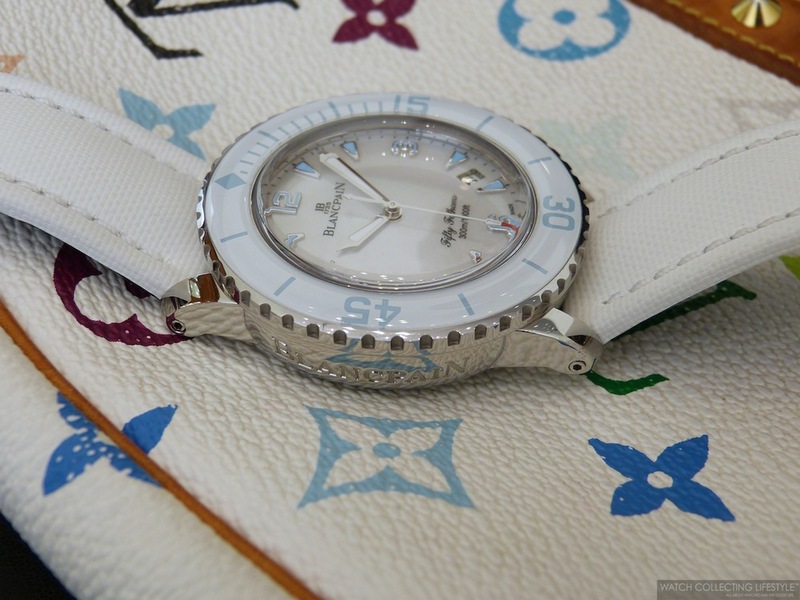 To make it even more ladylike, the watch is fitted with a gorgeous white sail canvas strap. Interestingly enough, the blue accents on the dial and bezel are the perfect match to the blue color on the limited edition Louis Vuitton White Takashi Murakami Monogram purses. The strap is fitted with a pin buckle; however, there's the option to get the deployant buckle also available for this model. Without a doubt, this is one of the most gorgeous ladies watches out there, that even though it is very sporty and a perfect ladies execution of the classic Fifty Fathoms, the watch still feels very feminine. This is a watch perfectly made for those watchlifestylers looking for the real deal when it comes to the timepieces that their significant others should be wearing. Sticker Price $17,200 USD. 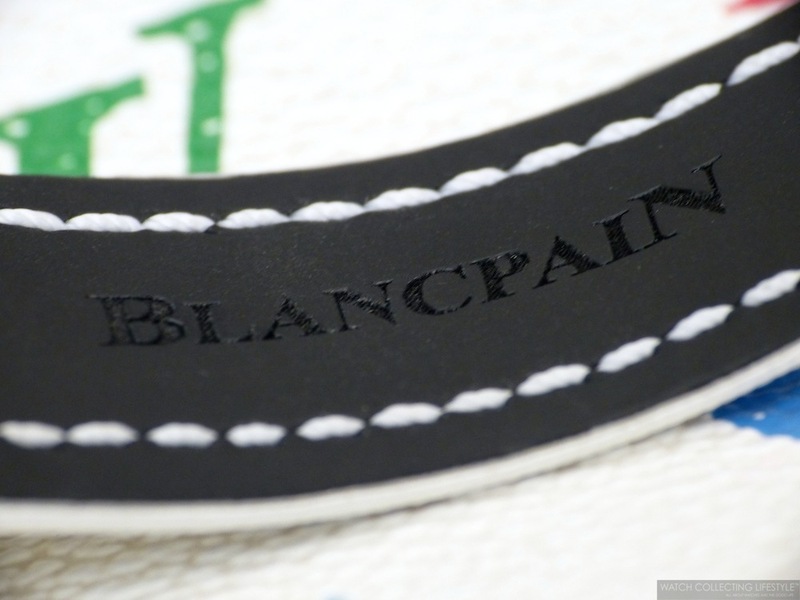 For more info on Blancpain click here. 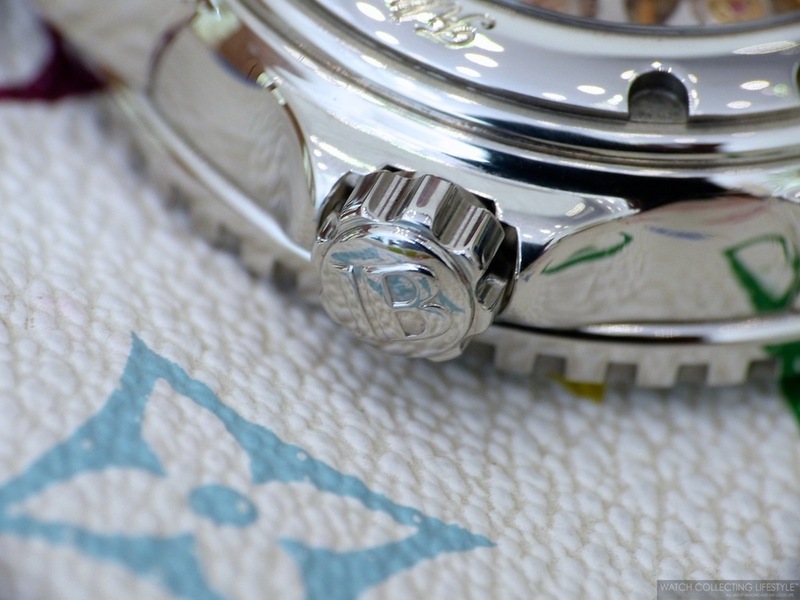 Posted on September 19, 2013 by Editor & Publisher and filed under Blancpain and tagged Blancpain Fifty Fathoms ref. 5015A-1144-52A Blancpain Fifty Fathoms Ladies White Dial.